On Monday, October 18, 1999, members of the Board of Directors with the faculty of St. Nersess Armenian Seminary joined His Eminence Archbishop Khajag Barsamian, Primate, in the service of the dedication of the new organ for the Seminary Chapel. 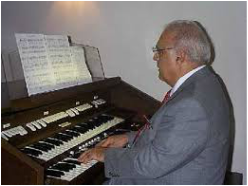 The organ was donated by the Gomidas Organ Fund, through the efforts of Mr. Berj Zamkochian who was present at the service. The organ at St. John's was dedicated by world famous organist Berj Zamkochian, shown here with Lance Luce, church organ consultant and theatre organist.